The Oxygen Unit began in July, 1944; it was located at the airport in Jorhat, Assam, India. Twelve machinists (gas) and one yeoman under the command of ENS J. A. Franson installed the first oxygen plant; the equipment weighed 150 tons. The first oxygen was produced on October 2; the plant reached optimum capacity by the end of the month. Jorhat was a major airfield for the Army Air Force and handled much of the shipments over the Hump, the 500 mile long air corridor over the Himalayan Mountains between India and China. Jorhat was the largest munitions depot in India. Oxygen was needed for the flights over the Hump and the Army tried to buy an oxygen plant. The equipment was scarce and the manufacturer would sell only to the Navy. Corporate reasoning was that navy personnel had experience with compressors and other machinery aboard ship and thereby could operate the complex plant. The fact that most members of SACO had never been to sea was not mentioned in the negotiations. The plan was for SACO to supply the oxygen for the flights and be repaid with tonnage over the Hump. A second oxygen unit arrived November 3 with ENS Jack V. Harvey, 18 MMGs and one yeoman. It was placed into operation on January 29, 1945. With two units operating, enough acetylene, used in welding, was produced to alleviate the shortage in India and China. In early 1945 the plants began shipping liquid oxygen in large tanks which increased the volume of usable oxygen while reducing the weight 50 percent. The liquid was converted to gaseous oxygen for use by pilots at the departure airfields. This innovation saved more than 40 tons a month in shipments to Myitkyina alone. Myitkyina was located in Burma, 220 miles southeast of Jorhat; it was roughly half the way to Kunming and on the west side of the high mountains. Initially 3,500 tons a month were being flown over the Hump; with the use of liquid oxygen and additional planes, the airlift increased to 22,000 tons per month. Despite the navy efforts the tonnage of much-needed supplies for SACO remained at 150 tons per month. The SACO men were called, sometimes with disdain, the “Assam Navy” by airfield personnel. All of the Army people had patches that identified their unit. 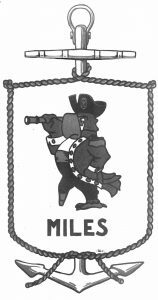 And by the end of the war Shipfitter Ashley had designed a patch which, though unofficial, the men of the 1st Oxygen Unit wore; it was a peg-leg pirate with a spyglass and the single word MILES below.